For our recent trip to the Materials Research Society Conference in Boston we filmed the following video that explain the extensive testing procedures performed in-house before we ship out the CS100 family of strain cells. Jack and Alex will be attending MRS Boston 2016. We would love to meet as many of our loyal customers as possible as well as spreading the word to new comers. Come along and meet us face-to-face in booth 1211! 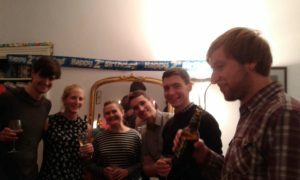 To anybody who didn’t know, Razorbill Instruments Ltd had its second birthday recently. 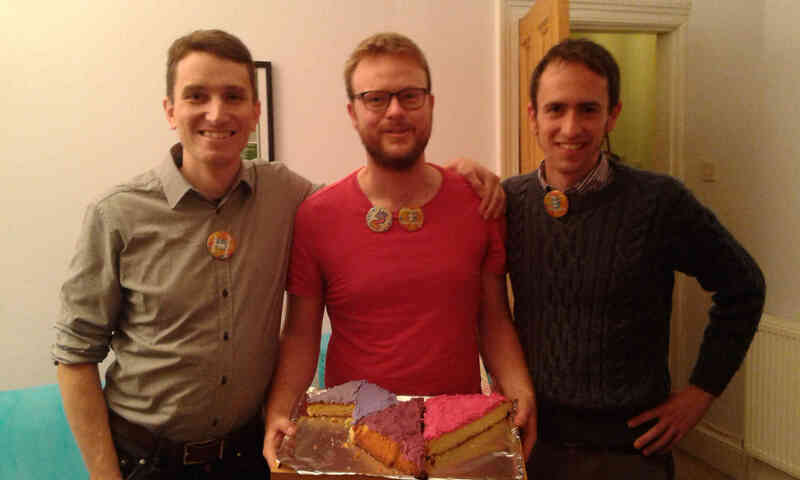 Thank you very much everyone who helped Jack, Alex and Cliff celebrate entering the company’s 3rd year. We’re looking forward to continuing the adventure next year as we go from strength to strength! 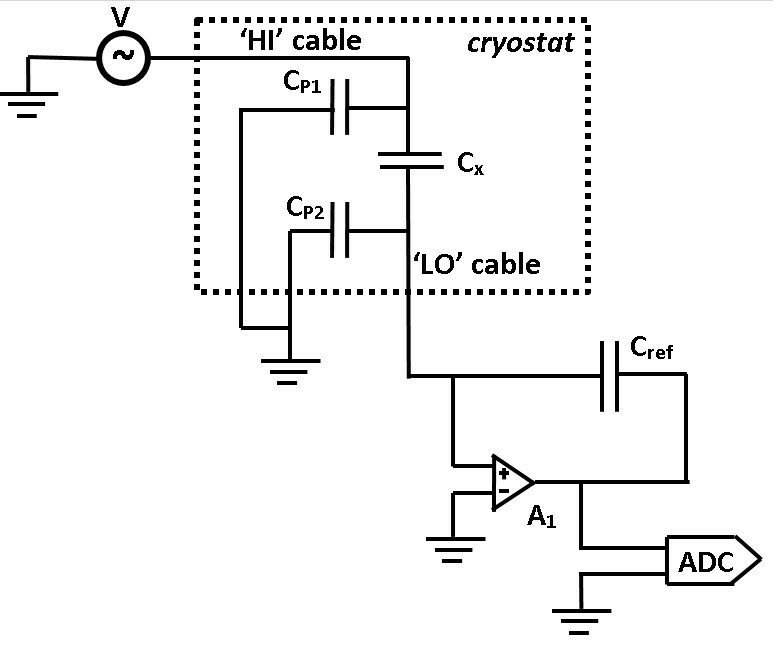 It is a fairly common in for cryogenic researchers to wish to measure a capacitance inside a low temperature environment. Unlike many electrical properties of materials capacitance is unaffected by the temperature of the environment or the magnetic field, meaning that it becomes a useful property to measure. 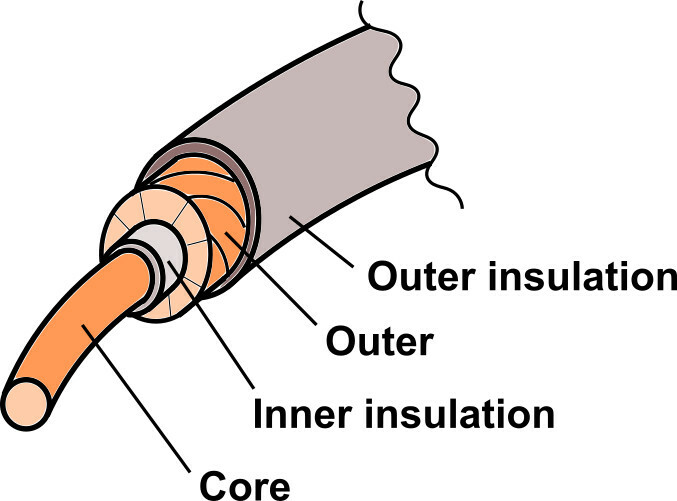 This practical guide is focussed on explaining how to correctly set up a coaxial feed-through into a cryogenic environment. Coax cables present several challenges to those who are not familiar with their use. If used incorrectly they can conduct unmanageable thermal loads into your cryostat and coax designed to avoid this is typically highly resistive. Most coax is pretty inflexible, especially if flexed at cryogenic temperatures and the additional grounded braid means that particular care must be taken to avoid ground loops. Because the function that defines λ must be empirically measured, for most practical purposes it is much more convenient to define the above integral as the difference of two integrals from 4K to T which can be looked up from an empirically derived table of values. Before fitting a cable into a cryostat it is necessary to calculate the heat load that you will introduce. 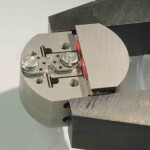 Let us consider the fitting of 1 metre of Ultra Miniature Cryogenic Coax C supplied by Lake Shore Cryotronics. The core wire is 0.203 mm diameter copper and the outer consists of aluminised polyester layer incorporating a second 0.203 mm diameter copper drain wire. 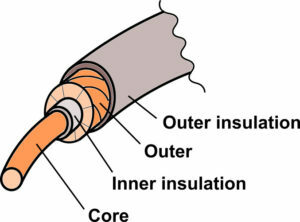 Because the majority of the heat will be conducted through the two copper wires, a good approximation for the heat conducted into the cryostat can be considered by assuming that the cabling is solid copper with a cross-section equal to the combined cross section of the core and drain wires. Plugging in the numbers gives 10.5 mW thermal load, for 1 meter of Lake Shore C miniature cryogenic coax table one end of which is held at 300K and the other at 4K. 10.5 mW is tolerable for most cryostats operating from 1K upwards. Some experimental set-ups will not have the spare capacity to soak up this thermal load, so steps will have to be taken to reduce it. If only small currents need be carried by the coax, then a higher resistance stainless steel coax may be used, which will also reduce the conducted heat by up to a factor of 50 but will have approximately a factor of 8 times higher resistance than the copper wire. A second useful strategy is to “thermally anchor” the wire so that it makes good thermal contact to a cold plate within the cryostat before it extends the final stretch into the coldest part of the cryostat. This won’t decrease the thermal load that the coax puts on the cryostat but will mean the most of the thermal load is taken where there is more cooling power and the sample will be least affected. This works particularly well with cryogen free systems, when the cable can be anchored to the cryocooler’s intermediate stage, and sub-kelvin systems where the cable can be anchored to the 1K pot, helium bath, or cryocooler. In order to make sure the coax is well thermally anchored, it usually necessary to have a length of cable typically 50-100 times the cable diameter in contact with cold metal. One way to do this is to wind a length of cable onto a copper bobbin, then coat it with potting epoxy or varnish. 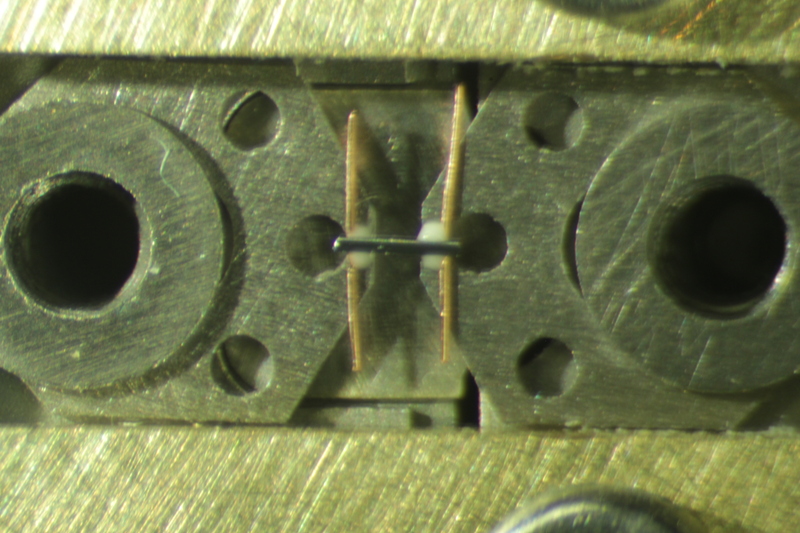 By winding half one way and half the other, one can minimise inductance and noise pick-up. In a metal, there is a fundamental relationship between the heat conduction at cryogenic temperature and the electrical conduction – the Wiedemann Franz law. Crudely this is because the phonons are frozen out at low temperature and the only heat carriers left are electrons, which are also the charge carriers. Consequently, there is often a trade-off between allowing too much heat flow into the cryostat and using cabling with prohibitively high impedance. Usually for a particular experiment and cryostat, you can have a ‘budget’ for heat flow permitted and electrical resistance tolerated and can select cabling accordingly. Where only extremely low heat loads are permitted, but the cryostat always stays below 8-9K, it may be possible to use superconducting coax which has an extremely low thermal conductivity and negligible resistance. Because of its cross-sectional structure, coaxial cable is typically damaged if forced into bending around too tight a corner. All cable is different and you should check the manufacturer’s recommendation, but it’s usually possible to bend the cable into a curve with a radius a few times the cable diameter if it’s only done once, or somewhat larger if flexed repeatedly. If the bending occurs at cryogenic temperature the problem is particularly acute. Like most other cabling the insulation on cryogenic coax is more brittle at lower temperature and can crack or break off if flexed while cold. A common problem in complex measurement systems is that that of ground loops, especially so with coax as each cable will have a grounded outer which makes wiring to ground without creating a ground loop all the more complicated. Ground loops occur when something in the circuit is connected to ground via more than one route. Because these routes will have non-zero resistances, circulating currents caused by electromagnetic interference can introduce variations in voltage in the ‘ground’. From there it can couple into the measurement through the parasitic capacitance between the shield and the thing it is shielding. Usually most of this noise will be at the AC mains supply frequency (50 Hz in the much of the world but 60 Hz in the Americas and Asia), but it’s not unusual to see local TV/radio frequencies or mobile phone transmissions. In the low noise environment of a research cryostat you might pick up something from your other measurements or thermometry which will make grounds loops harder to identify. The knack to avoiding ground loops with coax cable is to attach the braid to ground at only one end of the cable. For capacitance measurements, it is usually best to have the braid connected to the capacitance bridge or LCR meter, and nothing else. 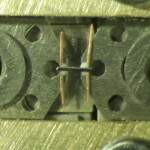 This means that the body of connectors should be connected to the braid of the cable, but not to the cryostat. Both the cryostat and the capacitance bridge should be connected to a safety ground – especially if the cryostat contains a superconducting magnet. Coaxial cable is commonly used to carry radio frequency signals and is most commonly encountered in TV and radio wiring. It is typically used because it is extremely well shielded from interference from external electromagnetic fields, because it doesn’t radiate when carrying high frequencies and because it has well-defined impedance to high frequency signals. This blog post describes its use at lower frequencies, particularly its use in experiments where a capacitance must be measured remotely with some length of cabling between the capacitor and sensing circuitry. This is particularly relevant to cryogenic experiments where capacitances often must be measured at low temperature inside a cryostat but the electronics must be kept some distance away, at room-temperature. In this case, we are using the coax purely for its shielding properties, and we don’t care about the other properties which make it ideal for RF use. No detailed knowledge of electronics is required, so many of the electronics justifications will seem overly simplistic and many researchers will be able to skip straight to our next blog post; Fitting coax cabling into a cryostat: practical challenges and considerations. Coaxial cable simply consists of an inner wire, the core, surrounded by a second wire, the braid, which entirely encloses it but is electrically isolated from it. Various types are available with single or multistrand cores and the outer may consist of a solid tube or in most cases a conductive sheath made of braided wires (hence the outer is often referred to as the braid) or foil tape. The ones with solid tube, known as rigid or semi-rigid coax, are designed for high frequency use, but as we’re only interested in shielding, the flexible types are sufficient and rather easier to work with. Naively it might be expected that the capacitance could be simply measured by connecting your capacitor plates up to your cryostats wiring and measuring the capacitance externally with a simple hand-held LCR meter. The reason why this approach falls down when a long wire is used, is that the wire itself will have its own capacitance. In most research situations, the capacitance being measured will be small and this parasitic capacitance of the wires will be larger than the signal. The LCR meter will simply be measuring the capacitance of the wires to their environment – junk! This is shown in the simple circuit below. Figure 1. Though we’re only interested in measuring Cx the wires attached to each capacitor plate have introduced their own parasitic capacitance, completely obscuring Cx. Using coaxial cables correctly allows the parasitic capacitance to be rejected. To the uninitiated, it can be surprising that to reject parasitic capacitance in the wires, we switch to coaxial cabling which has one of the largest capacitances of any cable – coax commonly has a capacitance of 100 pF/m, many times more than a typical unshielded wire. The reason why the coax cabling is typically used is so the parasitic capacitance can be controlled and rejected. With a typical wire, the parasitic capacitance is caused by the wire acting as one of the plates in a capacitor, the insulation on that wire acting as the dielectric, and the other bits of random conductive items that the wire happens to go near acting as the other plate. The issue is that the random conductive items are an unknown size and distance away and hence an unknown capacitance. If the wire or anything else moves, the capacitance will change. They are also at an unknown potential, if they are other wires carrying other signals, then those signals will couple into the capacitance measurement. Figure 2. A simple capacitive voltage divider. 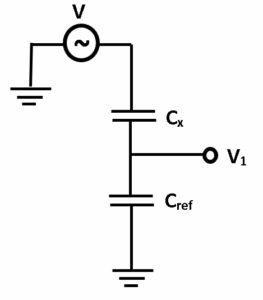 In the absence of a parasitic capacitance, a typical way to accurately measure a capacitance is make a half bridge circuit or potential divider. This allows the determination of an unknown capacitance by comparing it to a high precision calibrated capacitor. Rather than measure V1, as in the previous circuit, an alternative circuit could be to use an amplifier to hold the centre tap at ground. Because this point is held at ground but not directly connected to ground it is typically called a virtual ground. In the circuit to the right, Cx can be determined by knowing the output from the ADC, V1. For example, if Cref=Cx then V1 will equal to the excitation voltage, V. More generally V1/V=Cref/Cx­. The reason why this is a more useful approach is that holding the centre tap at a virtual ground using an amplifier offers a promising way to reject the parasitic capacitance if used in conjunction with the coax cables. Let us draw the circuit again with the parasitic capacitance explicitly drawn. CP1 is the parasitic capacitance of the driven ‘HI’ cable, and CP2 the parasitic capacitance of the detected ‘LO’ cable. 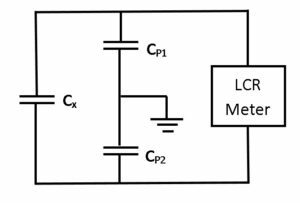 Below is the simplest circuit that can be used to detect and small capacitance Cx, while rejecting larger parasitic capacitances. Most bridges and LCR meters will use more sophisticated circuits which will be able to measure complex impedance and provide better signal to noise. Figure 4. 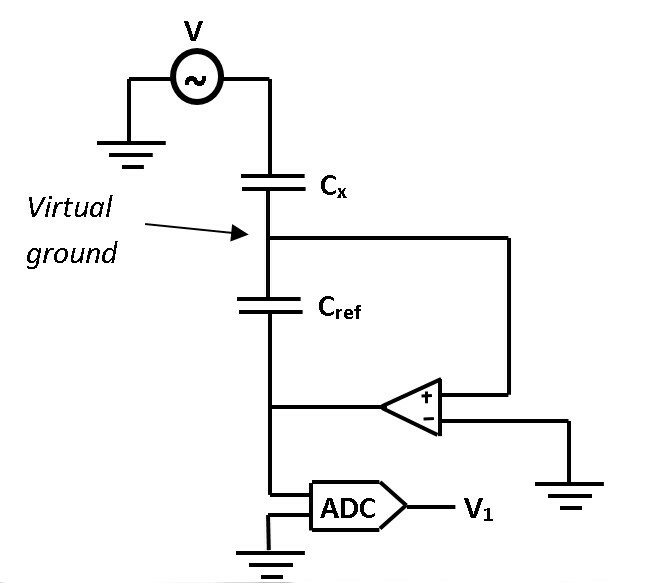 An auto-balancing bridge circuit showing explicitit parasitic capacitances being rejected. The circuit is driven through the HI cable with an oscillating voltage V. The parasitic capacitance of the HI cable, CP1 is irrelevant in this case – it will affect the amount of current drawn but little else as HI is merely for excitation, not detection, and is driven by a low impedance source. This means that the only parasitic capacitance that needs to be worried about is CP2, the parasitic capacitance of the LO cable. If coax cables are used the braid can be attached to ground, meaning that both the parasitic capacitances will also be to ground. This is very convenient because as in the previous circuit, the centre tap is held at a virtual ground – so that CP2 will be the capacitance ground to ground which will have no effect on the circuit. Consequently V1/V=Cref/Cx­ is just as relevant – both CP1 and CP2 are irrelevant to the measurement. This neat trick would not be possible without coax on LO because the parasitic capacitance would not necessarily share a common ground with the amplifier and could not be perfectly rejected. 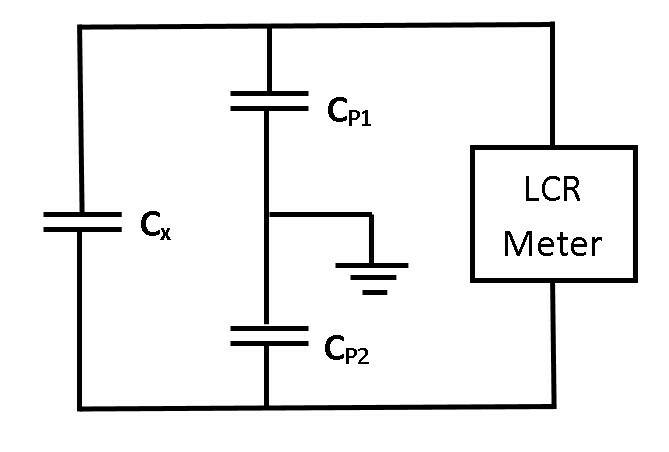 This type of capacitance measuring circuit is called an auto balancing bridge and slightly more sophisticated versions are commonly used in high precision LCR metres. Hopefully that has explained the importance of coaxial cables in measuring capacitance in inaccessible environments in a research context. The next blog post will explain what should be considered when fitting a coaxial cable into a cryostat for low-temperature use. 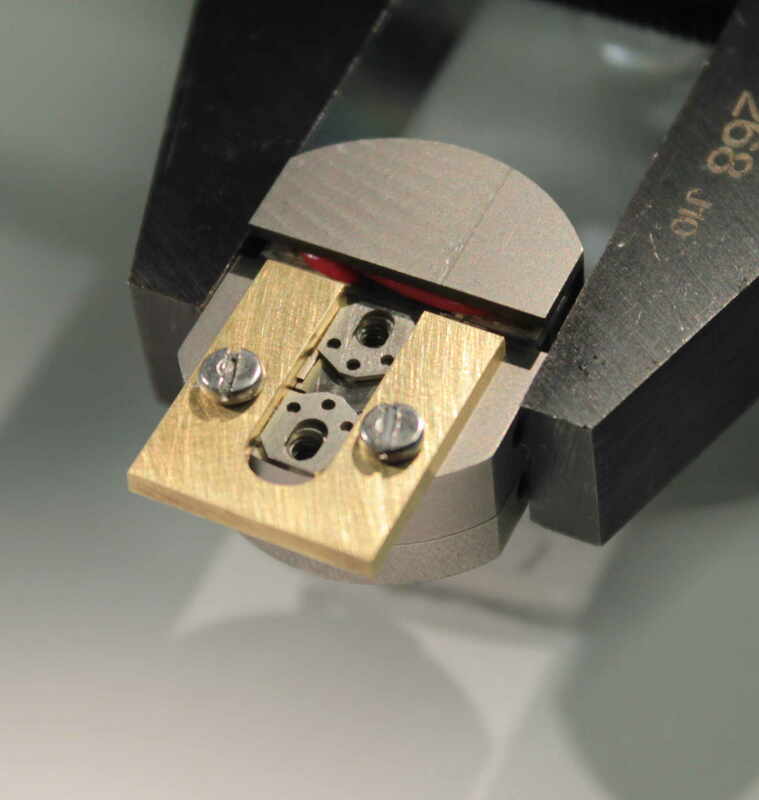 Mounting a small sample to any piece of apparatus can be a daunting prospect when the sample is just a fraction of a millimetre in two of its dimensions. 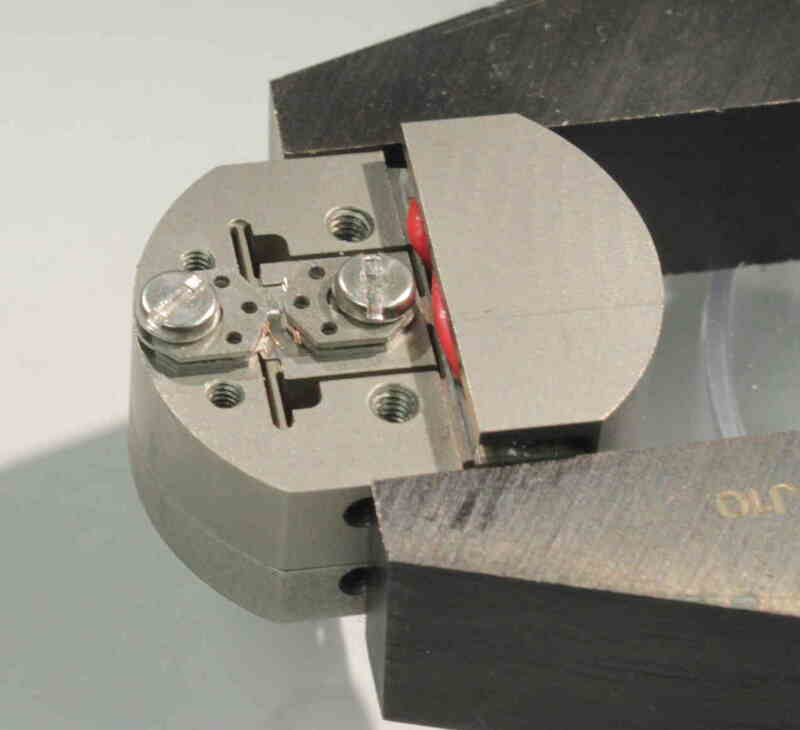 The sample mounting guide produced by Razorbill Instruments for mounting to the CS100 makes the process very straightforward. 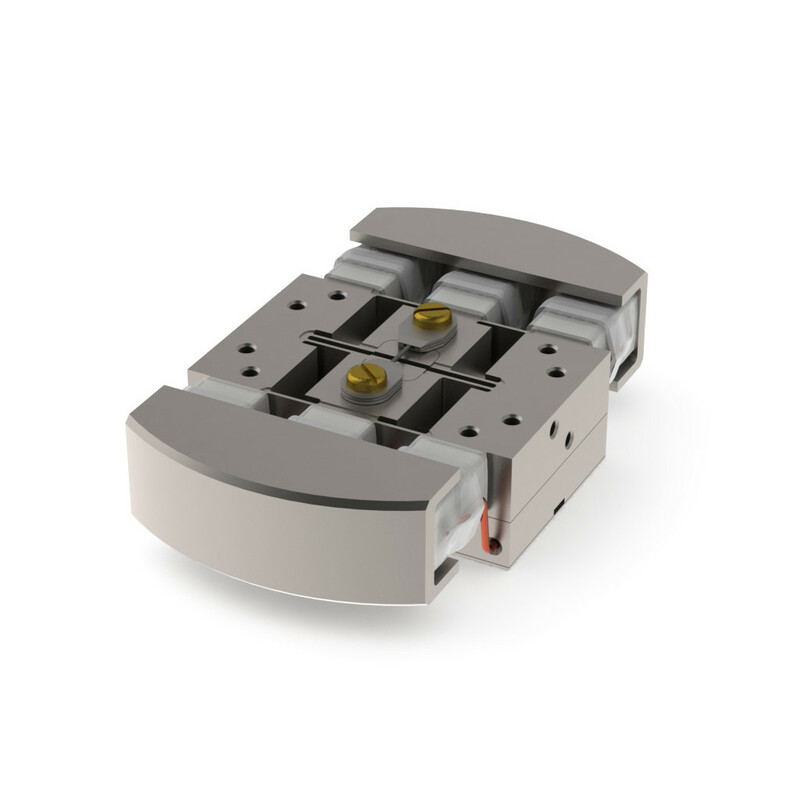 Having moveable sample plates means that gap between the the attachment plates can easily be adjusted to suit different sized samples and desired strains. The CS100 is provided with a sample guide that can be affixed to the top surface so that these plates can be conveniently positioned, not moving inadvertently when the screws are tightened at the end of the procedure. The sample to be strained can then easily be laid between the plates using the provided circular spacers as well as narrow diameter fibres or wire embedded in the epoxy above and below the sample to maintain the desired epoxy thickness. After the top sample plate is added and the screws are tightened the epoxy can be cured. If required, contacts can then be attached to the sample at this point. The strain cell is then ready to be inserted into the cryostat. 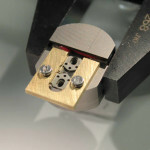 The full sample mounting guide is available by filling in the contact form on the product page of the website. Jack and Alex would like to thank all of our customers for supporting us during 2015. We hope that you enjoy your time off and have a happy and productive new year. Razorbill Instruments experienced strong sales after our product launch in mid-November and we are anticipating high growth in 2016, in which we will add a second product to our portfolio and add several additional personnel to the team. It's going to be an exciting year! Best wishes to everyone who has helped us we took our first shaky steps as we gathered momentum (with a special thanks to Scottish Enterprise and the Royal Society of Edinburgh). 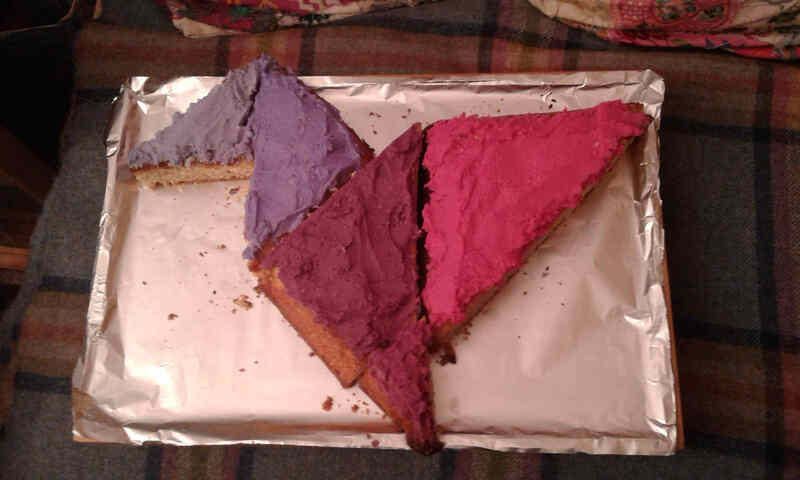 Have a very happy Christmas everyone! Today, Razorbill Instruments launched the worlds first compact cryo-compatible strain cell, the CS200. This device allows researchers to deliver precise 'stretching' and 'squashing' to small samples at very low temperature and high magnetic field. Seeing the influence of these deformations on the electrical properties of materials could have a key part of helping solve one of the big challenges in physics; the origin of so-called 'unconventional' superconductivity. This phenomenon could one day have huge impact on society; improving power transmission, allowing low-cost magnetic levitation and it will make the superconducting magnets already used in MRI scanners across the world cheaper to operate. The design for the strain cell is based on that developed and put into practice by Dr Clifford Hicks, now at the Max Planck Institute for Chemical Physics of Solids. He and his collaborators have been using the technology for over a year and it has already lead to a prestigious paper in the high-impact journal Science. Interested academics should contact Razorbill Instruments to discuss pricing and availability at sales@razorbillinstruments.com. 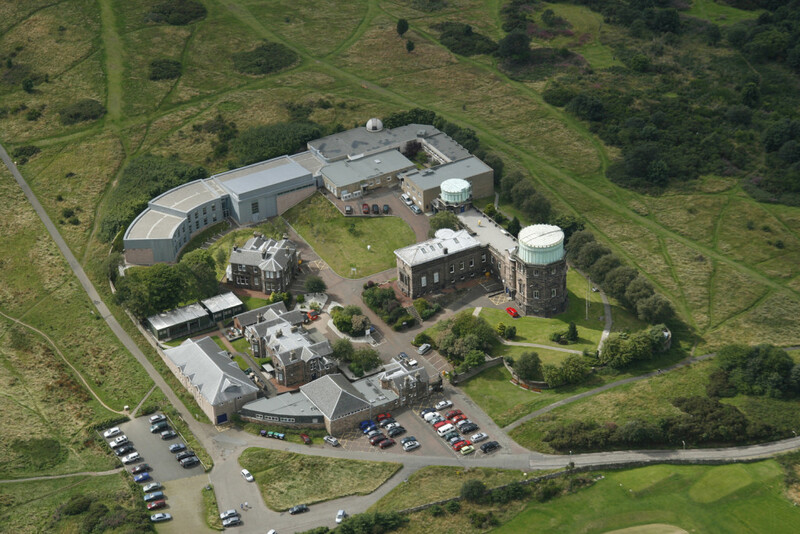 Razorbill Instruments has recently outgrown their current facilities in the University of St Andrews and will be taking up residence from October in the Higgs Centre for Innovation a soon to open office and research complex housed at the Royal Observatory Edinburgh, on the top of Blackford Hill overlooking the city of Edinburgh. The facility offers not just panoramic views, but state-of-the-art cryostats and assembly workshops as well as space for the company to grow into. 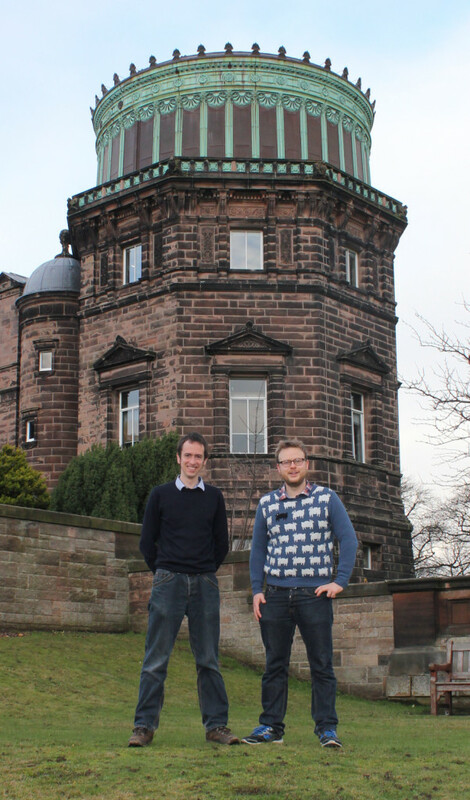 Today Razorbill Instruments made an appearance at the Centre for Doctoral Training in Applied Photonics annual conference with Alex Ward appearing as an invited speaker.